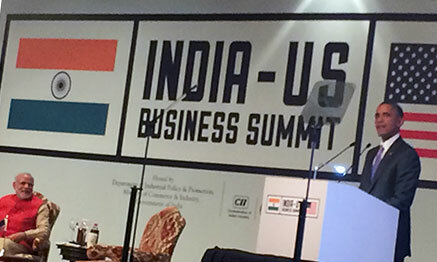 As part of President Obama’s official delegation to India, U.S. Secretary of Commerce Penny Pritzker joined the President and Prime Minister of India Narendra Modi at the U.S.-India Business Summit where they addressed a large group from both the U.S. and Indian private sectors on ways to expand market access and increase opportunities for U.S. firms through improvements in India’s business climate. Secretary Pritzker specifically addressed how Commerce can play a role in helping U.S. companies gain access to the Indian market and announced the expansion of the U.S.-India Strategic Dialogue to now become the U.S.-India Strategic and Commercial Dialogue. Along with Secretary of State John Kerry, Pritzker will lead this new diplomatic effort with the Indian government designed to promote more trade and investment between the two countries. Today at the U.S.-India Business Summit, President Obama, Prime Minister Modi, and Secretary Pritzker spoke with more than 40 CEOs and officials during a roundtable meeting. They discussed the business and investment climate in India and ways to increase commercial and economic cooperation. During the roundtable, President Obama touted burgeoning U.S. exports to India and said the two countries are moving in the right direction, while calling for even more trade and investment. Obama also stressed the factthat U.S. companies want consistency and clarity in the regulatory and tax environment in India. Prime Minister Modi and President Obama expressed confidence that continued bilateral collaboration will increase opportunities for investment, improve bilateral trade and investment ties and lead to the creation of jobs and prosperity in both economies. Secretary Pritzker joined both the President and Prime Minister in discussing ways in which U.S. companies could improve India’s infrastructure. Recognizing the important role that both countries play in promoting peace and security in the Asia-Pacific Region, President Obama and Minister Modi announced a India-U.S. Delhi Declaration of Friendship. The declaration specifically calls on India’s Minister of Trade and Commerce and the U.S. Secretary of Commerce to work together towards strengthening commercial and economic ties to advance mutual prosperity, regional economic growth and stability. Earlier in the day, Secretary Pritzker joined the President and Prime Minister at India’sannual Republic Day Parade and in a wreath laying ceremony in memory of unknown soldiers. Following the day’s business summit and dialogue, Secretary Pritzker hosted a private reception with U.S. and Indian business leaders and discussed next steps for improving U.S. access to the Indian market. 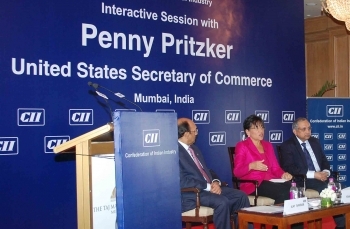 In July 2014, Secretary Pritzker participated in the U.S.-India Strategic Dialogue, along with Secretary of State John Kerry, the first U.S. Cabinet-level visit to India since Prime Minister Modi’s election. There, she led discussions on helping strengthen economic ties between the two nations. On the final day of her visit to India, Secretary Pritzker and Secretary of State John Kerry met with Indian Prime Minister Narendra Modi to discuss opportunities for strengthening the U.S.-India commercial relationship. Their trip was the first U.S. Cabinet-level visit to New Delhi since Prime Minister Modi was elected. Secretaries Kerry and Pritzker were in New Delhi for the U.S.-India Strategic Dialogue, which took place July 31. Launched in 2010, the U.S.-India Strategic Dialogue is the highest level regularly scheduled dialogue between the two governments and provides a forum to discuss U.S.-Indian relations. Secretary Pritzker led discussions aimed at strengthening the commercial and economic ties between the U.S. and India, focusing on ways the U.S. can collaborate with India’s new government to promote growth in both nations. Secretary Pritzker underscored the desire of U.S. firms to do more business in India, and discussed how U.S. businesses can collaborate with India in the areas of infrastructure and manufacturing to help the country meet its development goals. 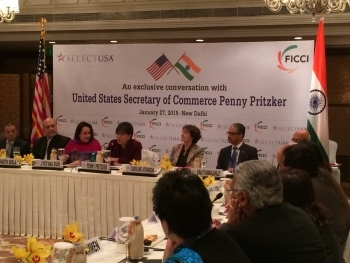 While in New Delhi, Secretary Pritzker joined the AmCham Infrastructure Committee at a breakfast meeting focused on receiving U.S. industry feedback on the opportunities and challenges that they face in the Indian infrastructure sector. Secretary Pritzker also met with several other Indian government officials, including her counterpart, Minister of State for Commerce and Industry Nirmala Sitharaman. During their discussion, Secretary Pritzker pressed forward on plans to create an infrastructure platform that will help U.S. firms serve as a partner on significant infrastructure projects in India. Secretary Pritzker also joined the Indian Minister of Finance, Defence, and Corporate Affairs Arun Jaitley for a joint bilateral meeting with Secretary Kerry. In addition, Secretary Pritzker met with Indian Minister of Power Piyush Goyal and discussed how American firms can use their capabilities and expertise to help India meet its ambitious energy-development goals.